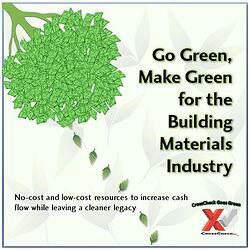 Building materials managers: Boost your bank account when building with green materials! Learn ways to adopt environmentally-friendly techniques while raking in cash. Go Green to Make Green! You can run your building materials company with the highest profits ever while still supporting the greater good of the planet.